A total of 110 km, but it actually took two days. We’ve definitively adopted the train-in-one-direction system which means we can see more and not have to cycle up all those hills again on the way back. 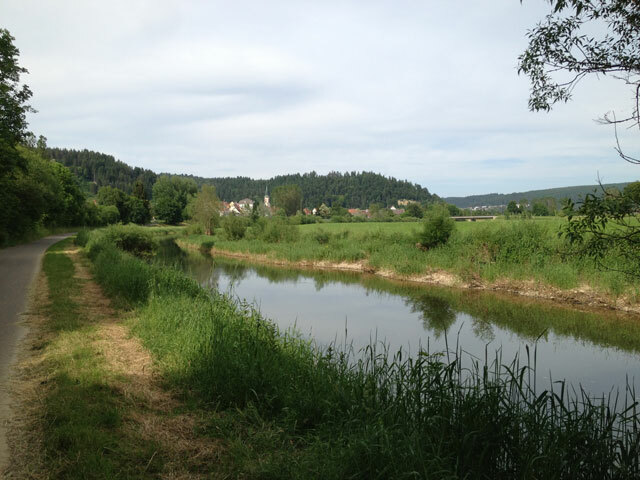 Jean Michel thought we should start with the source in Donau-Eshingen so we began day 2 by driving an hour to Tuttlingen and getting the train to Donau-Eshingen. Although it was as sunny and hot as the day before (over 30°C in the afternoon), it was not nearly as pretty. Our first disappointment was that the source is undergoing renovation so is not open to the public. 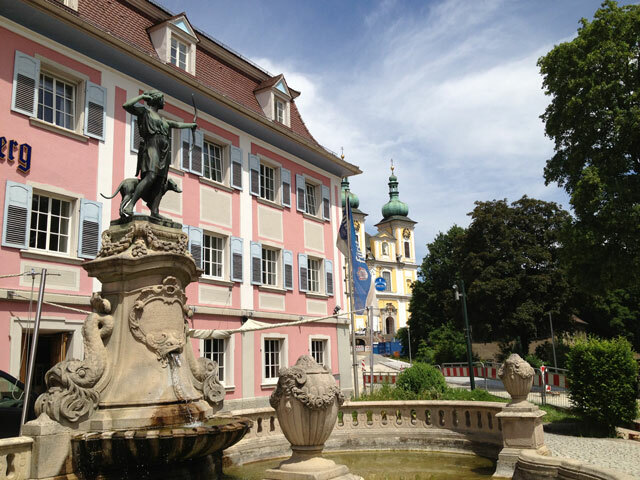 So after having lunch in Donau-Eshingen, we set out for Tuttlingen. The cycle route doesn’t always run along the Danube and we often rode through hay fields interspersed with flowers, which did, of course, have the advantage of mostly being flat. There were lots of irrigation canals, water irises, storks and covered bridges, but I missed the wonderful surprises of the day before. We didn’t see a single rococco church. 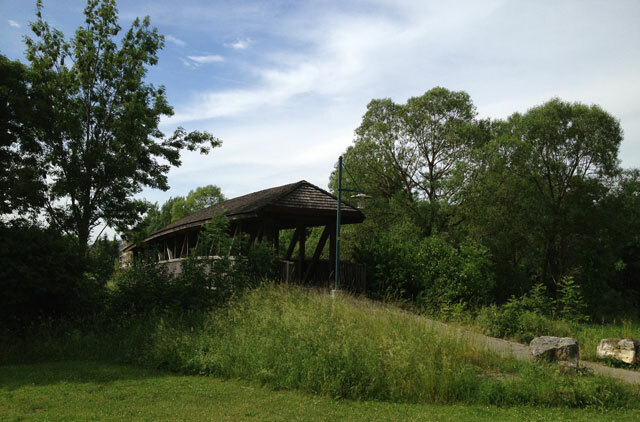 On the way home from Tuttlingen, whose main attraction is its modern covered bridges, Jean Michel suggested we go to the lookout at Knopfmacherfelsen which is about 750 metres above the Danube. The view is absolutely breathtaking with the monastery in Beuron in the distance. 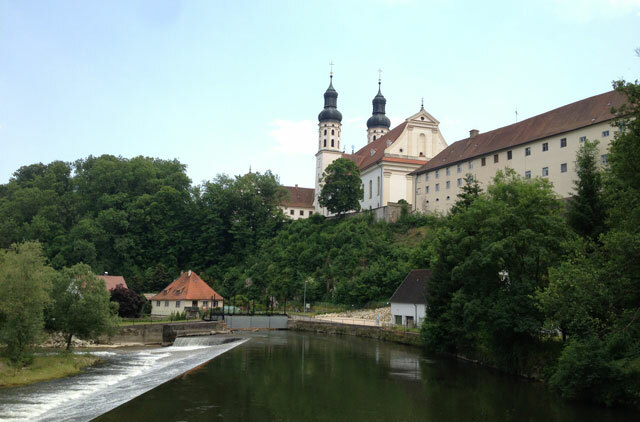 We then drove down to Beuron to see the monastery up close. Access was through a covered bridge. It was a truly wonderful way to finish off the day. Fortunately, day 3 was not as hot (only 23° at 9 am), because was lucky because it was VERY hilly (and also an intermittent fast day). We drove to nearby Riedlingen and parked at the train station since we intended taking the train back from Ehingen. It’s a pretty little town, with lots of colourful half-timbered houses and painted façades. 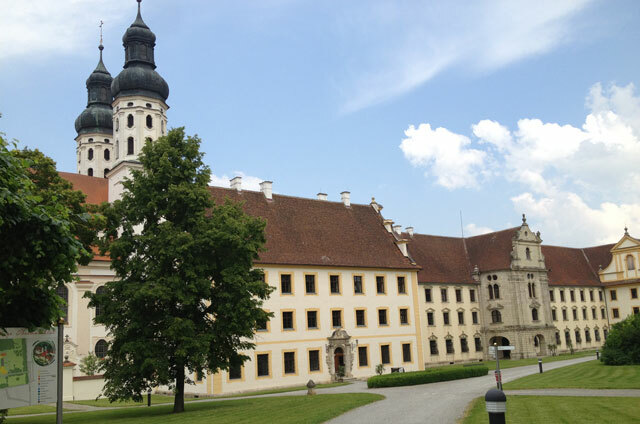 Before cycling along the Danube, we looped back to Altheim which our Gasthof owner had told us about. 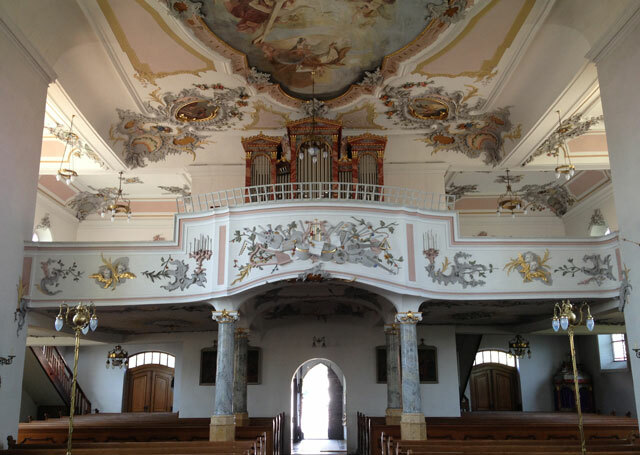 We found another beautiful rococco church with a painted balcony featuring bas-relief musical instruments. There was also a stunning vase of peonies which are very prevalent here and grow taller than they do in the Loire Valley. Back on the Danube we crossed a couple more wooden bridges and stopped for coffee in Riedlingen. 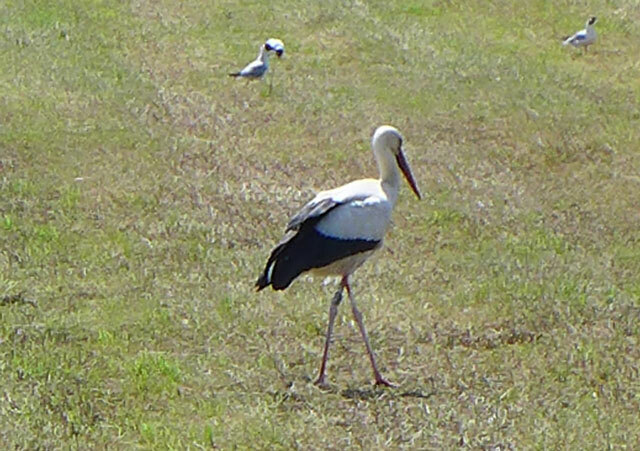 We then passed several fields full of storks which obviously explains why there are so many shop signs and sculptures of storks in the villages. 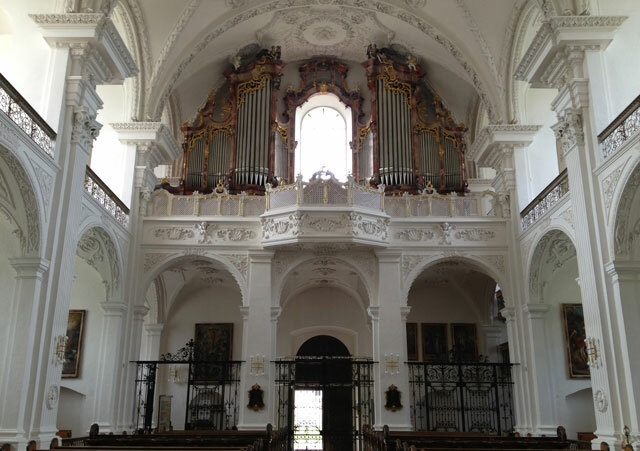 Our next stop was the Monastery Cathedral of Obermarchtel with more wonderful rococco and a balcony, but not as rich as Zwiefalter. As we came out, it was starting to spit which was a bit annoying as I had taken the rain capes out of the paniers. Fortunately, there were a few rumbles of thunder and nothing more. More hills and dales before we stopped at Munderkingen for a surprisingly good coffee. The sky was not looking very encouraging and we feared the worse. 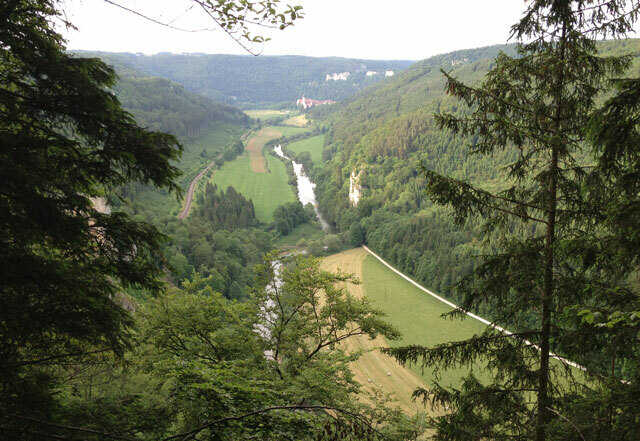 By the time we got to Rottenacker, about 7 or 8 K from our destination of Ehingen, fat drops were started to fall. We got a bit wet, but not soaked, and just made the train station in time. 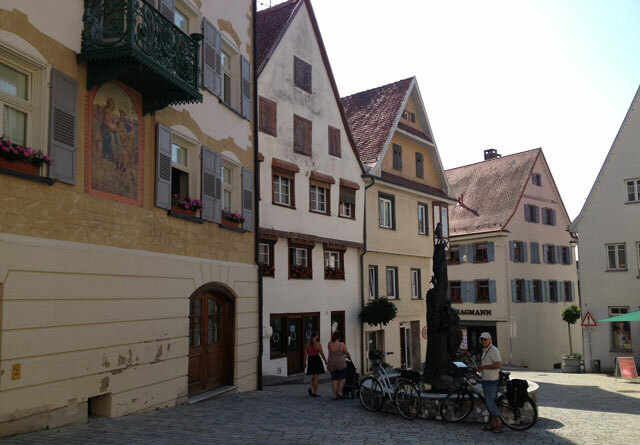 When we got back to Andelfingen, where we’re not staying at Gasthof Sonne (that’s the next one!) but at Gasthof Swanen, Frau Smidt told us they had had golf-ball size hailstones! That was a lucky miss. Tomorrow I’m putting the rain capes back in the paniers. And just for the record, despite our fast day (500 calories for me, 600 for Jean Michel), we cycled 61 kilometers including lots of hills. Tomorrow, we can have ice-cream and riesling again. This entry was posted in Architecture, Cycling, Dieting, Germany, Sightseeing and tagged cycling, danube, Eurovelo 6, Obermarchtal. Bookmark the permalink.